Shipping a Nano to the U.S. cost more than buying one in India. 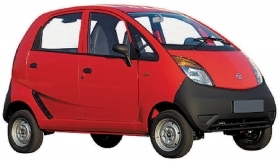 Everyone knows about the $2,500 price tag for Tata Motors' Nano, billed as the world's cheapest car. But Warren Harris, chief operating officer of Tata Technologies, which helped with the Nano's engineering, put the price into perspective at last week's CAR Management Briefing Seminars in Traverse City, Michigan. "I drive a Land Rover," Harris said. "The entertainment system in it costs more than the Nano." When Tata Technologies wanted to show a Nano in North America, it bought one in India and had it shipped. "The shipping cost three times as much as the car," Harris said.